Sailboats come in a variety of different traditional types and so to help identify who is who out on the water, we present a brief guide. The traditional difference between classes of sailboats is not in their size but the number and position of the masts. However, more modern developments in sailboat design have shown differentiations in the number of hulls they feature. The common type of modern sailboat is the single-mast vessel known as the sloop. These boats have a mast that is stepped or set into the deck or hull and which supports the two standard sails; a jib in front and a mainsail behind. They vary in size from under 10 feet to over 80 feet long. Variations on this standard design are the catboat and the cutter. The catboat is distinguished by featuring only mainsail at the front of the vessel, whereas the cutter differs in having the mast further back and in having two jibs as well as a mainsail. For those learning to sail at sailing school, with private lessons or independently then the single-mast sailboat is the sensible choice. Not only is it usually smaller and less expensive than other sailboat types, but it is also easier to get to grips with than a two-mast boat. Sized between around 40 feet and 150, two-mast sailboats are generally much larger vessels with greater ambitions in sail power and offshore voyaging. They are popular amongst sailors because of the flexibility in sail choice, and because they appear typically grander and more traditional. There are three main types of the two-mast sailboats; the schooner, ketch and yawl. 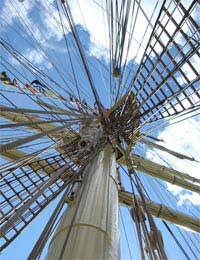 Schooners can be easily identified by having a foremast that is shorter than the mainmast. It is not unusual to find schooner with more than two masts, but as long as they have shorter foremast than main, they are always a schooner. A two-master that feature the taller mainmast in front and a smaller ‘mizzen’ mast behind, but in front of the tiller or wheel, are known as a ketch. The yawl is a much rarer craft than either the ketch or schooner, and in design is very much the same as a ketch only that the mizzen mast is situated behind the wheel or tiller. An increasingly common modern variation on the traditional sailboat type is in the number of hulls a vessel has. A standard traditional sailboat, as covered above and accounting for the vast majority, is technically known as a monohull, which simply means they have a single hull. However, two-hulled sailboats known as catamarans and three-hulled type known as trimarans, are becoming ever more popular. The benefits of these multi-hulls are that they are very stable, with the wide spread between hulls creating a strong leverage. Their width also allows for a pleasingly large space below deck. Catamarans are noted for their relatively smooth ride in rough waters and their fuel-efficiency. Within these standard sailboat types there are numerous variations, most notably in those that are specially adapted for day sailing, cruising or racing. Due to their manageable size, ease of use and affordability, daysailers are the most popular sailboats of all, and ideal for beginner sailing lessons. Apart from being single-mast monohulls, daysailers are distinguished by not having any overnight accommodation on board, hence their name. At the opposite end, cruisers are typically the larger and more luxurious of sailboats and can be distinguished from their daysailing counterparts by having below-deck accommodation. Racing vessels are not designed for comfort but to be aerodynamic. To aid their fast but superior handling skills the best of these boats are light and tailored for maximum stability.